Waffles are a favorite food at our house. I started using a whole wheat waffle recipe (shared at the end of this article), and my kids love it! That is a big win—healthy grains that kids actually want to eat. When we have waffles, it seems that I make a huge stack and they are gone before I can blink, let alone eat. I don’t have time for a mediocre waffle iron; I need one that gives good results fast! All waffle makers are not created equal. While many models look very similar, there can actually be big variations which can dramatically affect the taste and texture of the finished waffle. Additionally, there are features which will make your waffling experience a bang or a bust. The first thing to look for is non-stick plates. There is nothing more frustrating than looking forward to a delicious waffle and then not being able to get it off the machine. Non-stick plates also make clean up much simpler. Most waffle makers do not have removable plates, which means you have to wipe down the plates without submerging them in water. This is no big deal as long as there are non-stick plates. Another great feature is a temperature control. This allows you to choose the brownness level you want for your waffles. An indicator light and/or buzzer takes the guess work out of waffle making. It tells you when your waffles are done. Quality materials will help ensure your waffle maker will last a long time. Cheap plastic and poor hinges will not last. 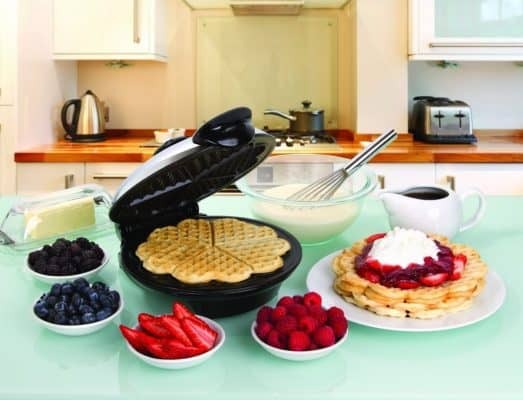 You don’t want to wait around all day for a waffle maker to heat up. Look for one that heats up quickly and retains the heat. 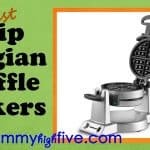 This article reviews traditional thin waffle makers, not the thicker Belgian variety. 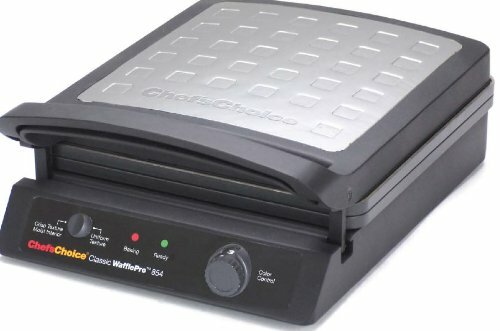 Here are my choices for top traditional waffle makers. Don’t let the size or price of this Cuisinart waffle maker fool you. The low cook times and even heating make some of my favorite waffles. This Cuisinart WWR waffle iron makes round 7-inch waffles in just two minutes. This is my favorite under $50 traditional waffle maker. It is small enough that storage isn’t a problem, but since it cooks so quickly, I don’t miss using a larger waffle iron. I love that this waffle maker has indicator lights to tell me when the waffles are done. With five heat settings, I can adjust how brown the waffles are according to my family members’ preferences. 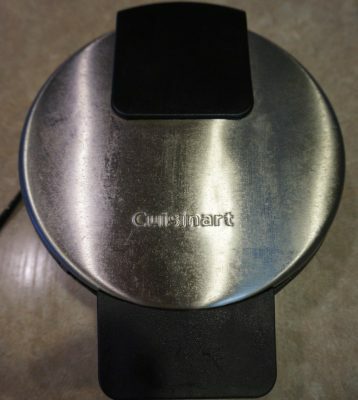 This waffle maker is stainless steel and is very durable. It comes with a three-year warranty. The only drawback I have found with this waffle maker is that the plates are not removable, which is quite common among waffle makers. It just means you have to wipe down the plates in order to get them clean. 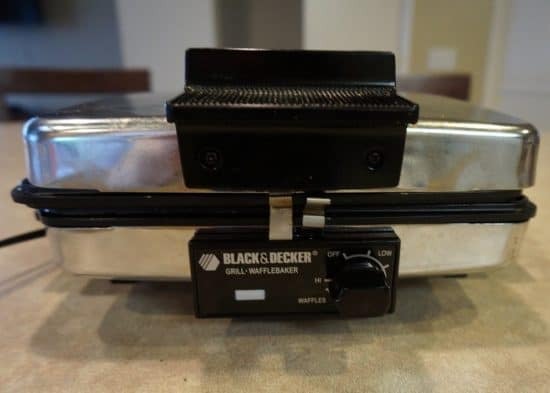 This Black and Decker waffle maker offers great versatility at a very affordable price! In addition to cooking waffles, you can also use this as a grill or griddle. One side of the plates is smooth, and the other side is a waffle grid. The mechanism can either press down or open up flat. This means you can make waffles, pancakes, eggs, or grilled sandwiches with one machine! I love that this waffle maker makes a large 8×8 inch square which separates into four waffles. There is also a variable heat control. Another great feature is the removable plates, which makes cleaning a breeze. The one downfall of this machine is that the waffle maker takes about five minutes to make a golden waffle. The Chef’s Choice 854 goes slightly over the $50 limit of waffle irons on this list but with a 2 minute cooking time as well as it’s larger-sized waffles, I felt it was deserving of a place here. You can pick it up for around $80. This is another great waffle maker. It makes the same size waffles as the Black & Decker, but the Chef’s Choice takes only two minutes to make waffles. It has indicator lights as well as a beeper to tell you when the waffles are ready. A floating hinge helps to ensure even thickness and consistent baking. The Chef’s Choice will give you great tasting waffles. However, there are a couple drawbacks. The grill plates aren’t removable for cleaning. It is also significantly more expensive than the Cuisinart and the Black & Decker. 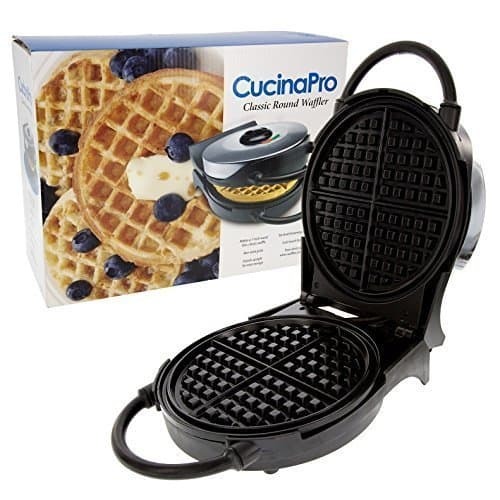 Cucina Pro makes a good classic waffle maker. It is similar to the others on this list. It makes a round 7-inch waffle. The plates are not removable for cleaning, but the non-stick grids make for easy clean-up. It has an adjustable heat control as well as an alarm that tells you when the waffles are done. There are some significant issues with this machine, however. It takes a long time to heat up initially, and then after you make one waffle, you have to wait for it to get back to temperature before cooking another waffle. Also, the alarm on this machine is very shrill and annoying. 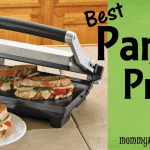 This machine will give you good results, but it will take considerably longer than the other waffle makers on this list. I recommend going with one of the others. when the waffles are done. 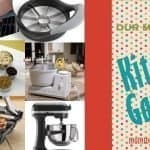 Overall, this makes good waffles, but there are some things to know before buying this waffle maker. The plates are very shallow, which means the end product is a very thin waffle, almost more like a crepe. Also, this machine cooks pretty slowly, taking up to five minutes per waffle. All of the waffle makers on this list will give you a good waffle. However, considering the price, features, and drawbacks of each waffle maker, I recommend the Cuisinart and the Black & Decker over the rest. These are both relatively inexpensive machines which will give you the best bang for your buck. The speed and quality of the Cuisinart make it my favorite classic waffle maker. The versatility of the Black & Decker makes it an easy choice as well. Looking for something else? 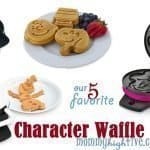 Be sure to check out our character waffle maker review as well as our budget flip belgian waffle maker review. Combine wet ingredients in one bowl and dry ingredients in another. Whisk the wet and dry ingredients together. Pour into a hot waffle iron and cook according to manufacturer instructions. *I love this quick, healthy recipe. I used to spend forever beating egg whites to ensure a fluffy waffle. However, this recipe doesn’t require any beating and still gives a fluffy, delicious waffle.